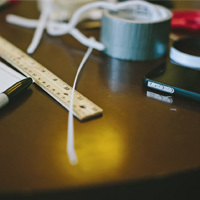 What is the best way to build career success? 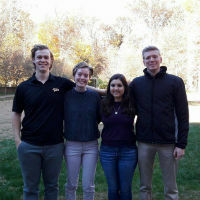 Last Friday and Saturday, two teams of William & Mary students from the Raymond A. Mason School of Business traveled to Atlanta, GA to compete in the Deloitte FanTAXtic Regional Competition. 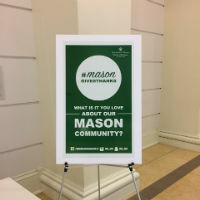 The Mason Gives Thanks campaign at the Raymond A. Mason School of Business asks students, faculty, and staff to reflect on why they are thankful for the Mason community. 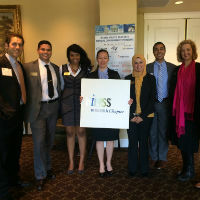 MBA students from William & Mary's Raymond A. Mason School of Business took top prizes in the poster competition at the Healthcare Information Management Systems Society Virginia Chapter (HIMSS VA) conference held on Oct 25-26. 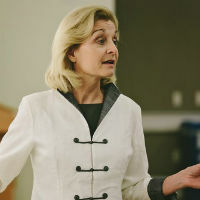 Jame Keith '79, former ambassador to Malaysia, recently spoke to Executive MBA students about the end of engagement with China. 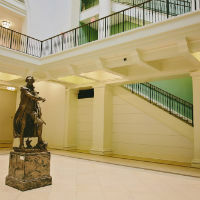 The 2017 installment of the MBA for Working Professionals Conference will be hosted at Miller Hall. 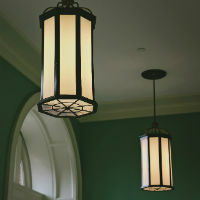 The announcement was made at the end of this year's conference, which was hosted at UCLA. 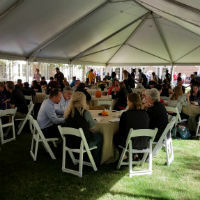 The Undergraduate Business program from William & Mary's Raymond A. Mason School of Business hosted its annual Masonfest event on Wednesday, Oct. 12 at Miller Hall. 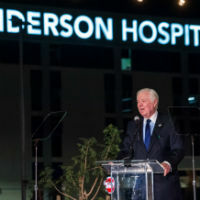 Alan B. Miller '58, Chairman and CEO of UHS, celebrated the opening of Henderson Hospital in Nevada, with the Alan B. Miller Patient Tower being dedicated in Miller's name. 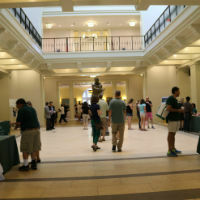 Alan B. Miller Hall, home to the Raymond A. Mason School of Business, opened its doors to more than 150 students, families and friends on Sept. 24th as part of William & Mary's Family Weekend. 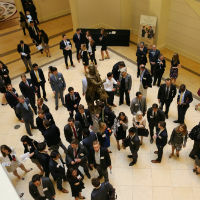 Students gathered at Miller Hall to take part in Dog Street to Wall Street, an event that focuses on the finance industry. 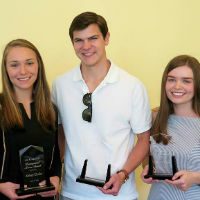 Mason School students accepted internships with some of the most sought-after companies in the United States including Deloitte, IBM, Amazon, Booz Allen Hamilton, Comcast NBC Universal, Procter & Gamble, General Mills, and others. 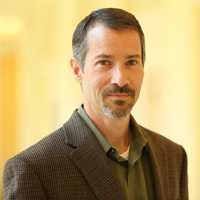 Content from a popular business course offered by the Mason School's Entrepreneurship Center will soon be available to students online, thanks to a $27,000 grant from the Creative Adaptation Fund. 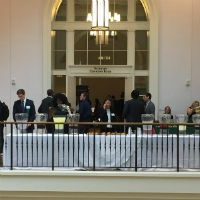 On Friday, over 400 undergraduate and graduate students attended Meet the Firms, an event put on by the Raymond A. Mason School of Business. 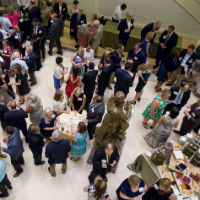 The Executive MBA at William & Mary celebrated its 30th anniversary as alumni returned to campus for a weekend of events. 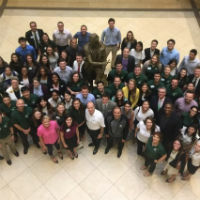 Incoming freshman across a variety of majors recently gathered at the Raymond A. Mason School of Business as part of William & Mary's PLUS (Preparing for Life as a University Student) program. 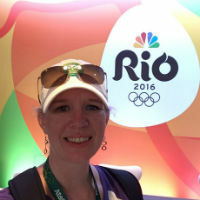 Valerie Williams, MBA student at the Raymond A. Mason School of Business, landed a dream internship with NBC Universal that brought her to Rio for the 2016 Summer Olympic Games. 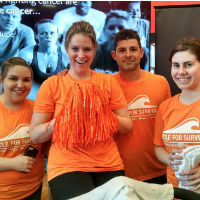 EY achieves the highest percentage giving rate among big four firms in Accounting Firms Giving Competition. 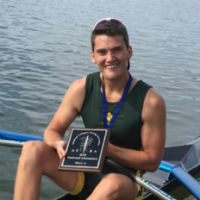 MBA student, Will Meeker, won the men’s single scull (1x) at the American Collegiate Rowing Association’s (ACRA) national championship in Gainesville, Georgia. 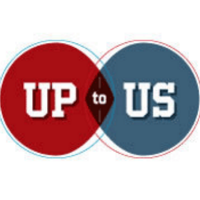 Students from the Mason School take first place in the national "Up to Us" competition and receive recognition from President Bill Clinton. 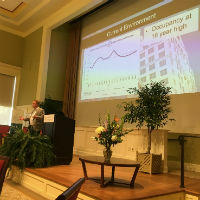 Associate Dean Ken White presented findings from the Tomorrow's MBA project along with Max Rapp, PhD. 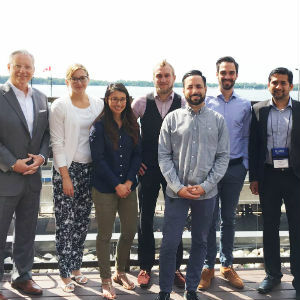 of HYVE at the HCI Conference. 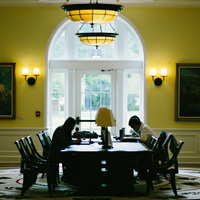 Dedication to scholarship, community, and the desire to make a positive difference in the lives of others is the foundation of principled leadership and the cornerstone of the educational experience at William & Mary’s Raymond A. Mason School of Business. 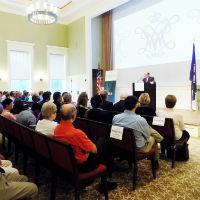 The Raymond A. Mason School of Business recently received a generous gift to fund teaching and research in its Executive MBA program. 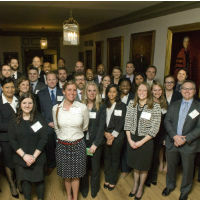 The Washington Area Alumni Business Alliance (WAABA) held its sixth annual reception last week at the Ritz-Carlton in Tyson's Corner. Success in today’s business climate requires an understanding of international policy and economic conditions in countries across the globe. 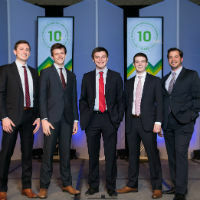 Mason School team makes it five out of the last six years with this year's CFA Research Challenge victory. 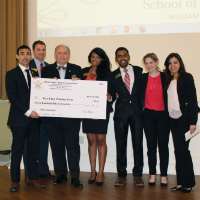 The William & Mary Online MBA program hosted its inaugural residency this February. 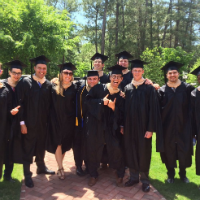 Online MBA student and freelance writer, Leslie McCullough, describes the experience. 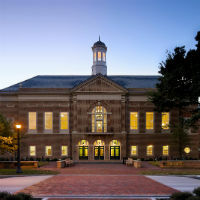 Bloomberg Businessweek recently announced its annual ranking of undergraduate business programs. 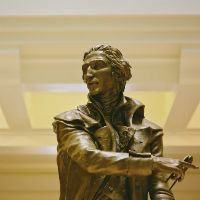 Mason School jumps up ten spots to #12. 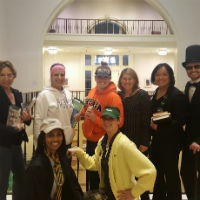 On Friday, March 25, Full-Time Raymond A. Mason School of Business MBA students, faculty and staff participated in the annual Mason Idol, a talent show and charity auction that raised $6,700 for Kidz ‘N Grief. 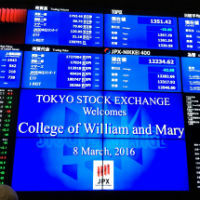 (Photo by Arvin Nundloll) Fourteen Full-Time and Flex MBA students from the Raymond A. Mason School of Business, led by Professor Don Rahtz, traveled to Japan during Spring Break for the 2016 Global Immersion trip. 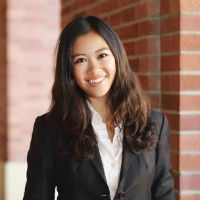 A Raymond A. Mason School of Business graduate has been included in Forbes Magazine’s inaugural “30 under 30 Asia” list. 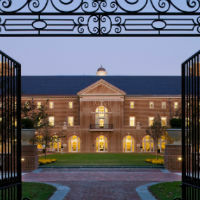 Pocket Yiqing Sun, who graduated from William & Mary in 2013, was named to the 2016 class for her success in the field of finance. 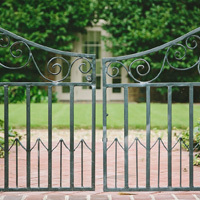 The Peace Corps and ALEX AND ANI have teamed up to launch a new jewelry collection in support of the Let Girls Learn initiative which seeks to expand educational opportunities for females around the world. 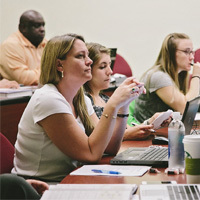 Cutting-edge curriculum prepares students for high-earning careers in business analytics. 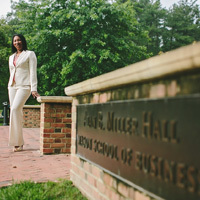 Karen Locke, Professor of Organizational Behavior at the Raymond A. Mason School of Business was chosen as the next Pat and Margaret Walsh Professor in Ethics and Business Leadership. 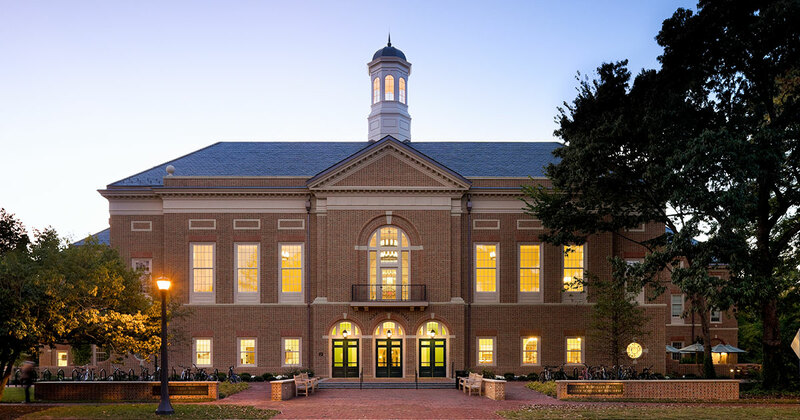 Net Impact, a student organization at William & Mary’s Raymond A. Mason School of Business, focuses on equipping future businesspeople to act in socially responsible and environmentally conscious ways, thereby improving the world around them. 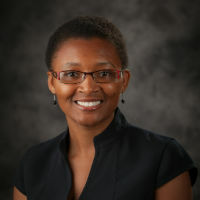 Business Professor receives grant to study "consumer wisdom"
The student organizations at the Raymond A. Mason School of Business connect students from a diverse array of majors to the resources of the Business School, helping them explore careers, gain valuable academic insight, and connect with like-minded peers. 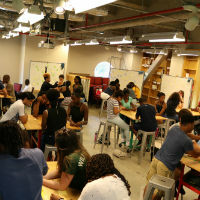 These clubs have been keeping busy this semester. 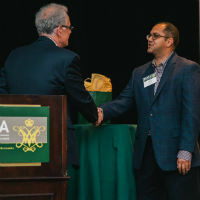 Mason School Contest Named Among ‘Most Innovative Business School Ideas of 2015’ The Mason School's innovative crowdsourcing effort, “Tomorrow’s MBA: Co-Creating the Future of Business Education,” was featured in Poets and Quants "Most Innovative Business School Ideas Of 2015."